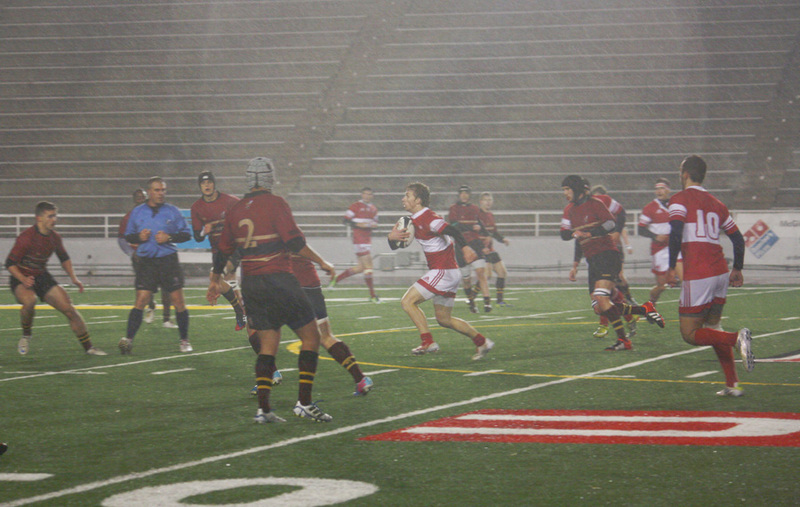 A crowd of almost 700 packed themselves under the overhang at Molson Stadium for shelter from the rain to watch the McGill Redmen rugby team defeat Concordia 16-6 to take home their eighth consecutive RSEQ championship on Friday Nov. 22. The Redmen jumped out to an early lead the same way they have done throughout the season—on the back of an impressive kicking game by senior fullback Cameron Perrin. Junior wing Robert Ashe added a try to push the team ahead in the first seven minutes. With the lead in hand, McGill stifled the speedy Stinger backs, crushing rally after rally with long kicks out of the Redmen zone. When Concordia was finally able to charge the ball down to Redmen territory, the Stingers met stiff resistance in a pivotal scrum on the five-meter mark. With the first half winding down, the Redmen put together a long run down the sideline after an excellent grubber kick left three McGill backs in space. A beautiful, fast-paced passing sequence led to a Redmen try just before the half expired, but it was recalled by the referee due to a penalty seconds before the conversion. Through the first half, both teams had difficulty scoring; the wet field slowed down the pace and movement of the game and turned it into a physical affair. Caught up in frequent rucks, penalties were being called throughout the game, with yellow cards handed out to Redmen players Noam Berson and Patrick Mulherin. However, McGill clearly outmatched Concordia in strength, speed, and agility as the ball was kept in the Stingers’ zone for the majority of the game. The match’s physicality resulted in a scary moment as Concordia winger Caleb Jordan suffered a head-to-head collision with a McGill player early in the second half and had to be taken off the field in a stretcher. Play resumed after a 25-minute delay. Perrin continued his terrific play in the second half, padding the lead with a penalty kick from 30 yards out with 18 minutes to go. In the backfield, the Stingers were stumped time and time again by McGill’s powerful group of forwards, anchored by the RSEQ Rookie-of-the-Year Spencer Paveck. As time wound down, the Stingers grew increasingly desperate and disordered, coughing up the ball in their own zone. McGill’s Thomas Stokes finally put the nail in the coffin with a long penalty kick to put his team up by a final score of 16-6. The win is especially sweet for the Redmen; the last time McGill fell in a championship match was in 2005 against Concordia. It also marks McGill’s RSEQ-leading 14th conference championship, a number that Cuillier expects to grow as McGill looks to defend its title in the coming year.